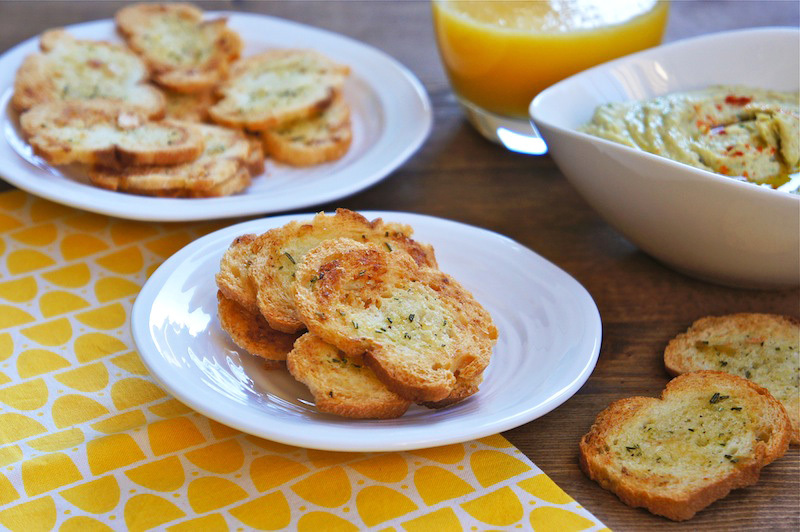 These little baguette chips are crispy, and irresistible with dips. Preheat the oven 350˚F. Line a baking sheet with parchment paper. Put the butter with garlic, rosemary, sea salt, black pepper in a bowl, and mix with a rubber spatula until well combined. Thinly slice baguette into 3mm-thick slices with a serrated knife. Spread some flavored butter on sliced baguette, and place in a single layer. Bake in preheated oven for 9 to 10 minutes or until light brown and crisp. Remove from the oven, and let it cool completely before serving. Perhaps they should be called bruschettini. These are known as baguette chips or crisps over here. It's great to learn another for the toast. hanks for sharing the info. I have to try this one... Great share! So tasty.... I want some now. What kind of dips do you use? Looks soo good. Love everything with garlic! Also love the name of your blog (I'm a huge fan of sea salt)! Looks delicious would be great with a salsa.